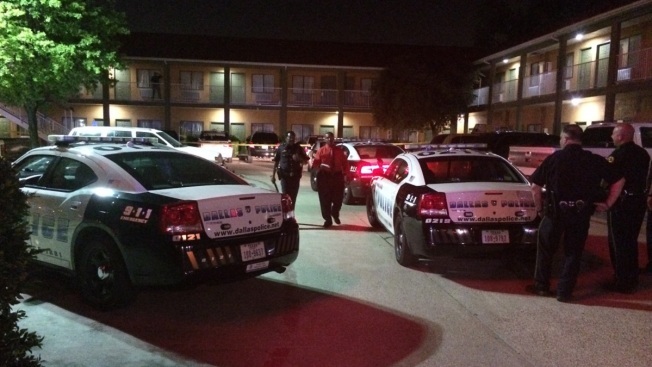 Dallas police are investigating a shooting at a hotel Wednesday morning that left one person dead and another in critical condition. The shooting happened at the Royal Inn at 2030 W. Northwest Highway shortly before 3 a.m.
Police said a man and woman were shot on the balcony of the second floor of the hotel. "A male and a female victim were reportedly involved in a disturbance of some sort on the balcony with an unknown suspect," said Sr. Cpl. Sherri Jeffery with the Dallas Police Department. "The unknown suspect then shot the two and fled the location." Both victims were taken to the hospital following the shooting. The 25-year-old female victim received a gunshot wound to the head and died from her injuries. The male victim, whose age has not been determined, is in critical condition. Investigators said the suspect in the shooting fled the scene in a gold vehicle. The motive in the shooting is still under investigation.